It is that time of year when we all begin to make promises to ourselves that often times we break. Rather than make a resolution, I have decided to be aspirational. Resolutions feel like a “have to do” whereas for me, aspirations are a “want to do.” For 2018, my aspiration is to live fearlessly. When I talk about living fearlessly I am not talking about bungee jumping or sky diving (although that might be fun and would definitely be out of my comfort zone). My intention is to live fearlessly into my purpose, which is to support others in recognizing and living into their greatest potential. I believe in the power of the human spirit and want to play my part in harnessing that for the greatest impact and highest good. Practice Mindfulness. There is so much talk about mindfulness these days that I wonder if sometimes the way in which we talk about it is actually diluting the experience. Mindfulness is not something we do. It is how and who we are. Mindfulness requires focused intention and attention. There are several ways to raise the level of mindful leading and living and there are many resources to help you do so. One resource in particular is the book Finding the Space to Lead by Janice Marturano. The book is clear and, most importantly, practical. Additionally, I recommend having a practice of sitting quietly, if even for five minutes a few times a day. Here’s what works for me. I breathe and notice. Is my mind racing? If so, I gently bring my attention back to my breath. I stay awake to the sounds I hear, the smells in the room, the weight of my clothes on my skin and my feet on the floor. I notice what I am feeling and where in my body I am experiencing those feelings. Sometimes I notice tightness in my chest, a crick in my neck or the dull ache of stress across my shoulders. Sometimes I feel calm and peace. And I continue with conscious breathing no matter the experience. Mindfulness supports our ability to remain clear and deliberate in the choices we make and the actions we take. We can begin to reflect on how our thoughts, choices, and actions support our ability to live fearlessly and with compassion both for ourselves and others. What are you saying yes to that you really mean no? What is causing you to make that choice? As I become increasingly clear about my purpose – the why of my life and my work, it becomes easier for me to discern those decisions I make and actions I take so that they are in alignment with my purpose. When the pace of life continues to increase and the situations we face become increasingly complicated, it is so easy to say yes without even thinking about why. It is automatic (the opposite of mindful). Check your assumptions about your “yes.” Is it really true that if we say no, it is political suicide or may result in the loss of a friendship? Who might you talk to in order to determine if those assumptions are correct? Likewise, if it is our habit to say yes because we tend to be people pleasers, what impact is that having on the approach with which we follow-through on the yes? How much resentment gets created? What ends up falling through the cracks as a result? Are you saying yes because you hoard opportunities and may not want someone else to get it? If we are holding on so tight to our habitual pattern of “yes,” we have no room or time to reach for what might be. align with my values and my strengths? serve the people in my life, both personally and professionally, and the organization from which I serve? impact my health and well-being so that my ability to be fully present to others is not compromised? support my longer-term goals and legacy? “No” is sometimes the most courageous and helpful thing we can say. Our willingness to say no may open up opportunities for others to try something new. It may give you the opportunity to focus in on the important priorities of your life and leadership in a way that is more fulfilling and inspires more engagement. In reality, letting go and/or saying “no” frees up space for possibility. As you enter 2018, consider what might be possible for you if you choose to say yes and no – mindfully and with conviction? Courage as the antidote to fear. Darius Rucker has a new song where the refrain is “When was the last time you did something for the first time?” Wow. As the old saying goes, we are creatures of habit. The impact of a life of habits may be a life of complacency. It takes courage to shake things up a bit; to do something new. So I began to ask myself, what might I do for the first time? Once again, it does not have to be bungee jumping or skydiving. It could be speaking up in a meeting when you typically just observe despite having something to say. It could be trying a new food. You could decide to become curious about a particular person in your life –professionally or personally. Ask them about themselves. What are you curious to know? Take some time to think about the small things that you might do for the first time. Notice how energizing that can be – even if you don’t like sushi. Since hearing that song, I have tried to do just that….something for the first time. Sometimes what I do for the first time is small in the grand scheme of things and other times it requires much more courage. I choose to speak the truth of a situation or of myself. I choose to be vulnerable in a setting that is often ruled by bravado. I try something different. In 2018 and beyond, I aspire to live fearlessly. I am choosing to sit and be still, to be intentional about my yes’s and no’s, and to challenge myself to try new things, speak my truth and show up authentically. Living fearlessly will support my ability to live authentically, and be fully present to my life and the lives of others. The results can be transformative and the impact greater than we could imagine. Try it. 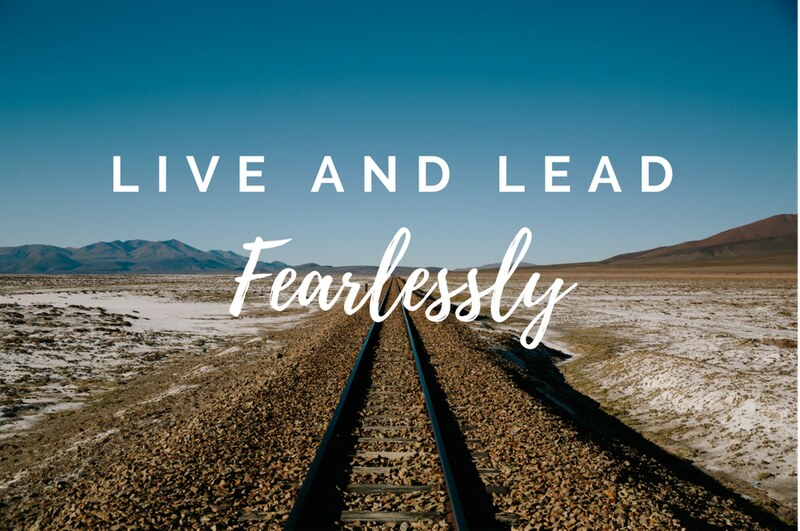 Live and lead fearlessly to live and lead fully.